10 Reasons Why I Love EasyLunchboxes! I've been packing school lunches now for over 8 years - I started when my two oldest were 18 months and going to a little developmental toddler preschool a couple days a week, and now they are almost 10. In that time, I've tried a LOT of different lunch containers and lunch packing strategies. There are a lot of great lunch containers out there, and I would definitely still recommend many of them, but one continues to rise above the rest. For our needs and the way I like to pack lunch, one of my top picks for lunch containers continues to be EasyLunchboxes. They just work - as the name says - to make lunch easy! These are absolutely the best value you are going to find anywhere for a lunch container. I'm going to tell you right of front that this is NOT a sponsored post, I'm not getting paid or compensated in any way by EasyLunchboxes to tell you about these. One of the big reasons I share my lunches on this blog is to try to help out other busy parents like myself, and I am such a big fan of these lunch containers that I thought I should tell you why. I surprised myself a bit when I realized that I've been using these for several years but I've never actually written a blog post about why I think they're so great. So it's about time. A little chicken salad and a cheese stick for protein, carrots, tomatoes and cucumbers for veggies, grapes for fruit, and a few pretzels for a carb. 1) The divided sections help me pack a balanced meal. If I remember to put a fruit in one section and a vegetable in another, and a protein in a third, then whatever meal I pack is going to be just about right. Using this kind of "bento" style box is especially helpful when you are packing a lunch late at night or early in the morning and your brain and creativity really aren't in it. You don't have to think too hard. Just remember: protein, fruit, vegetable. Throw in a few other little carb items to take up some space in the tummy, and you'll be good to go. They really do make it easy to pack a balanced meal. Sandwiches, homemade granola bars, strawberries, and grapes. 2) The portion size is just about perfect for any appetite. I can pack it lightly for my lighter eaters, or I can really cram it full for my husband, and we all feel like we've had the perfect size lunch. I've had a few comments from folks about how it doesn't look like enough food, but honestly you would be surprised at how much they hold. A lot of the lunches I share are packed for little kids with small appetites, so it looks like a small amount of food because it is. But I promise you these will absolutely hold a full meal for a hungry adult. I've tried some other boxes there were honestly too big for a kid's lunch. I of course like to make my lunches look nice, and I feel somewhat compelled to mostly fill every space. With bigger boxes this meant I was packing way too much food for a 5 year old to eat. I've got 10 boxes and even more lids in this tight little space - no other lunch container could do that. 3) They nest together for storage. To me, this is an absolute must. It is the one feature missing from all the other containers I have tried and otherwise really liked. Containers that don't nest for storage just take up too much space! I've really tried to make some other containers work in my kitchen storage, and I just can't. I pack at least 4 lunches every day, sometimes 5 or 6 if I'm packing for my husband and/or myself. And I try to get the lunches packed ahead of time. That means I have lunches packed and in the fridge while I have other lunch boxes still at school, or in the dishwasher. So this means that we really need at least 2 or 3 full sets of boxes. Boxes for 4 people, times 3 sets, is 12 - 18 containers. If they didn't nest together for storage I would need an entire cabinet just to store them, which would never work because we have a small house and a small kitchen. You can see in this picture that I have 10 containers nested in this drawer, and I think about 13 or 14 lids. This same space would hold only a few of any other style of container. The nesting also makes them great for family picnic packing. Once we've all eaten our lunch, I can nest the boxes together, which saves space in our bag. 4) They are very affordable! A set of four on Amazon right now is $13.95 (And has been that same price for several years!). No other good quality reusable container can even come close to that. There are some other really awesome containers out there, but they are so expensive I would absolutely break the bank if I tried to buy 12 of them! I quit my career to stay home with my kids, and that means that our budget is really tight. As much as I like some of the other designs out there, spending $20 to up to $80 for a fabulous stainless steel lunch container (yes, just one!) simply isn't happening. With four kids and a tight budget, affordability is absolutely an important factor in choosing what to buy. Some of the containers in this picture are 3 or 4 years old, and they are in just as good of shape as the new ones. 5) They are super durable! I have boxes that are several years old and have been through the dishwasher on an almost daily basis and are still in perfect shape. We have had a couple of lids crack, mostly because they aren't actually designed to withstand the weight of a child standing on them, and you know what kids can do with their lunchbox. But with regular daily use (and not abuse), they seem almost bulletproof. The boxes maintain their shape and the lids maintain their great bright colors. These things get tossed around, stacked, thrown in the dishwasher, left in bags for days, and they keep on going. They haven't stained, they don't get a wierd smell like some stuff can over time..
6) They make it easy to pack a lot of lunches at once. If I've got all my ingredients ready to go, I really can throw together four lunches (or sometimes even 6 or more!) in just a few minutes. The simple design and having them all the same shape and size allows me to just line them up and go. With four little kids and a super busy schedule, I need efficiency. I need to not have to think about which container to grab for which item, or which lid fits which box, or which box fits in which bag. 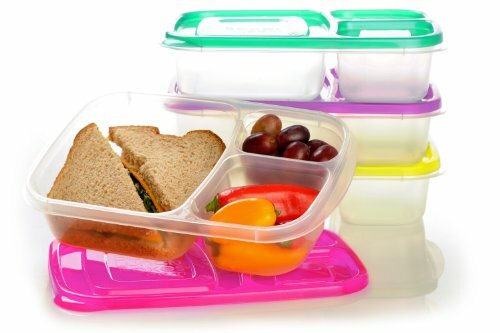 Using all the same containers, same shape, same size, every day, makes lunch packing quick and efficient. We love the variety of colors! 7) They come in great colors. This might not seem like a must have for many families, but for us it is. There are three different sets now, each set has four colored lids. With multiple kids in the family, the color options work out great. My kids favorites are the Brights, I like the Classic colors for my lunches, and my husband prefers the more subdued Urban set. Each of my kids has their color, so it makes it very easy for us to know which lunch is theirs when we have packed a whole stack. I usually try to pack the lunches as much the same as possible, but there are often just little differences between them, even if it's just quantity differences for my big eaters and my small eaters. It's very nice for me to put the right color lid on each box when I make it the night before, so when we pull them out in the morning we don't have to guess which box goes in which bag. To make super quick lunches, cook up big batches of muffins and freeze. This lunch goes together in no time - muffins from the freezer, homemade applesauce, cheese, crackers, prunes, apples, and a few cookies. 8) They are really versatile. The options for how and what you can pack in this style of box are almost endless. You can use the big space for a large item like a sandwich or a burrito, or you can customize it by inserting some little silicone containers or sauce cups, and pack just about any kind of meal you want. Make your own lunchable, or pack a salad with dressing, liquids like yogurts and dips work great in the mini dipper containers. Look at my post with my other favorite lunch packing products and you can see even more about things I use to customize the lunch. 9) Simpler really is better. I love a fancy set of tiny little containers just as much the next person. They are so cute, fitting together like a little puzzle. The former marketing manager in me is very drawn to shiny stainless steel containers, or the fancy boxes with all those little sections of different sizes. But the realistic and busy mother packing four lunches has totally been there and done that, and have learned the lesson the expensive way, that simple is best. Really, all those little containers with all their tiny lids. Or those fancy ones with the rubber seals that can't go in the dishwasher. No thanks. EasyLunchboxes are basic, they are simple, and they get the job done with minimal pieces and no fuss. And that just works for me. 10) They work great for kids of all ages and abilities. One thing you have to know about these containers is that they are not leak proof. But this is by design. They are designed by a real mom, and they were made to be easy for little hands to open. My littlest kids, and my child with significant fine motor delays, have no trouble getting these boxes open, or putting the lids back on. I tried other containers with tighter sealing lids, and my kids couldn't get them open. I think it's really important for even the youngest kids to feel independence with their food and feeding, so I would rather they not have to ask for help opening their lunch. I think it's especially important for a child with a disability to have independence wherever you can find it for them, and providing my son with a lunch that I know he can access himself is a small way that I can help make his sometimes difficult days just a little easier. The drawback to being easy to open, however, is that they don't have a super tight seal on the lid. Honestly this has never been a problem for me, and it is a trade-off I am absolutely willing to make. I try to avoid sending super messy foods anyway, and if I do send something liquidy - like yogurt, applesauce, dressing, dip, etc. - it just put it in another little container inside the EasyLunchbox. I also have had good luck with putting these wet foods just in one of the small compartments of the box and then covering that section with a bit of plastic wrap. If you get the press-and-seal kind it works even better. The only little drawback with this method is that little kids are not going to put the plastic back if they don't eat the whole thing, so you might have spillage on the way home. But honestly, with kids, you're going to sometimes have a mess no matter what kind of container you use. They are kids, after all. Bonus: There is a real (nice) person behind these products. I could have kept going, but 10 seems like a nice round number. But I do want to tell you this. I love that EasyLunchboxes were designed, with love, by a mom - who also happens to be a super amazing gal that I've gotten to know a bit since I started telling everybody about her products. When I am investing in a product that is going to be a big part of our lives, I like to go to the company's website and find out a little more about them. And I liked what I saw on her website - she is right there, a real person, who put some real thought into designing her product, and who will actually respond to your email or to your comments on her facebook posts. She stands behind what she sells. I like that. So there you go! All the reasons why I love EasyLunchboxes! Now go and get yourself some! You don't have to break the bank buying other lunch supplies either. With just a few basic supplies you can pack just about anything. Along with the basic EasyLunchboxes containers, these are the other supplies and accessories that I use most often. If you were going to get only two things, I would get the Mini Dippers and the square silicone cups. You can also look for silicone muffin cups at places like Ikea or at craft stores like Michael's, and you can get little dip or dressing containers at the grocery store. I like to keep some disposable spoons, forks, and skewers on hand too. They are certainly not necessary, you can send washable utensils, but my kids have a habit of losing them. If you want to go above and beyond - a few cookie or biscuit cutters and a set of cute bento picks and you'll be all set.